Fuji X-H1 review: Is the biggest X-series the best? In 2018 it's certainly the turn of mirrorless cameras to really up the pressure being put on DSLR cameras. We've already seen the excellent Panasonic Lumix G9 deliver strong in performance terms, not to mention its stills and video output. Now Fujifilm wants a piece of that pie, with its highest performance X-series camera to date, the X-H1. We spent some time with the biggest X-series camera ahead of its official unveiling - the company's first to introduce in-body image stabilisation - and have since borrowed the camera for review to dig into its full offering and assess whether it's the mirrorless camera to take the crown as the professionals' choice. There's always something distinct about Fujifilm design: there's a certain retro chic about the X-H1, but in a somewhat understated, chunky design. With a scratch- and weather-resistant magnesium body - which is 25 per cent thicker than the X-T2's equivalent - this is one mirrorless camera with robustness at its core. It looks like a bit of a beast - given it's not a million miles from a DSLR-like scale - which is purposeful, as the designers wanted to ensure even larger video-focused lenses would feel correctly weighted on a camera like this. Plus there's a 200mm f/2.0 lens now available, which ought to be a perfect match with a body such as this. Asserting its premium status, the X-H1 draws from the upper echelon's of Fujifilm's range, utilising the same LCD top display screen as found in the GFX 50S medium format camera. It's a great-looking display that's easy to read in even dim light, plus there's a manual button to back illuminate the panel to easily see it in the dark. No more fumbling around, then, although the buttons don't adopt glow-in-the-dark finishes, which is a missed trick. Fujifilm X-H1 versus Panasonic G9: What's the difference? Just like its Panasonic Lumix G9 competitor, the X-H1 also brings dual SD card slots, both of which are UHS-II compatible to ensure the utmost speeds for burst shooting and video capture. Which is necessary given how speedy such modes are (more on that later). At the controls the camera feels well weighted, its lockable ISO and shutter speed dials are great to use, while a dedicated Quick Menu (Q) and adjustment joystick control ensure ease in operation. However, all that chunkiness doesn't actually make the X-H1 feel like the most ergonomic Fujifilm to date in our opinion. Around the back the X-H1 has a lot of similarities with the step-down X-T2. The 3-inch LCD screen, for example, can be tilted for waist-level or overhead work in either portrait or landscape mode - which is something no other camera brands offer. However, and just as we said of the X-T2's implementation, it's really fussy to flip between portrait and landscape operation and we actually prefer the fully adjustable out-to-the-side-screen of the Panasonic Lumix G9. It's also not possible to 'hide' the Fuji's screen to help protect it. On the viewfinder front, the X-H1 has an impressive spec. Its magnification ensures it's huge to the eye, which is great for composition, while a 3.68m-dot resolution and 100fps refresh rate ensure detail and smoothness in operation. The eye-level sensor is quick to activate its use, and we found it our go-to option when shooting the majority of the time. The finder's only "problem", as such, is that the Panasonic G9's is larger still and has a faster refresh rate (120fps), too, which sees it a step ahead in this regard. Oh, and the dioptre seemingly got knocked too easily too often, which saw us adjusting it a number of times over the weeks of use. As we mentioned up top, the X-H1 introduces Fujifilm's first in-body stabilisation system for the company's mirrorless range. Not only that, its 5-axis system is said to be good for up to 5.5-stops, making it one of the best in the business. Is it really that good, though? We've found it to be highly effective when shooting hand-held video, while even 1/8th second shots have been just sharp enough - well, so long as the subject doesn't move - but it's not always capable to the full 5.5-stops. Most lenses will adopt 5-stops, while longer focal lengths will typically be less - just to ensure your expectations are in check in that regard. In terms of autofocus performance, the X-H1 largely mirrors the X-T2. That means a combination of on-sensor phase-detection and contrast-detection to grab those subjects in double-quick time, over a range of up to 325 autofocus areas. It's marginally improved in terms of software compared to the X-T2, not that we could feel a real-world difference. But seeing as its smaller brother is one of the most capable continuous autofocus mirrorless systems on the market, that's no bad thing. A lot of factors play into the autofocus ability, of course, such as lens choice and lighting conditions. We've been shooting models and a harpist in the studio using continuous autofocus, which has done a good job of locking on to subjects. When backlighting has come into play, however, things have taken a little longer and, when the focus point is set to its smallest possible, autofocus has frequently failed. We think Fuji needs to go back into the way this smallest point functions to make it more usable, like the pinpoint mode found in the Panasonic G9. With moving subjects the ability to whirr off a series of shots is often handy to get the best composed and sharpest results - it can help rule out the nuances of movement from one frame to the next. And as the X-H1 can blatt out eight frames per second (8fps) with continuous autofocus, it's helped to grab bags of great shots. And as the shutter button is hyper-sensitive (too much so in our view; that said, it's similar to a pro DSLR, like the Canon EOS 1D X II, which is what it's trying to compete against in some respects). Here's where things get interesting though: add the optional battery grip (VPB-XH1) and that rate can be up to 14fps (with electronic shutter), which is up there with the fastest on the market. It's not the fastest, though, as the Panasonic G9 can strike a massive 20fps - and that doesn't even need the optional battery grip to do so. What we particularly like about Fujifilm's battery grip is that it takes two additional batteries, taking the count from one to three. That can make a massive difference in terms of longevity, with between 900-1,000 shots per charge quoted. We got through all those batteries' juice over the course of a day, shooting around 500 shots and a few minutes of video, seeing the camera come up short of its quota. 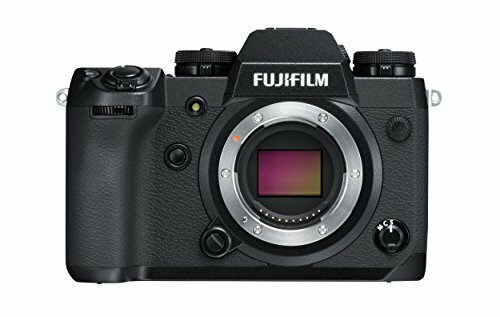 Rather than introducing a new sensor for the X-H1 flagship, Fujifilm has opted to use the same 24.3MP X-Trans CMOS III sensor as found in the X-T2. There have been some processing tweaks, but image quality between the two cameras is otherwise one and the same. That means good quality, but we feel that the X-H1 ought to have been a platform to push things yet further. That's not to say the results aren't pretty mind-blowing at times. Fujifilm's handling of dark shadow areas in lower ISO settings keeps colour noise at bay, maintaining richness and contrast that some competitors lack. It's the lowest ISO sensitivities certainly hold the most detail, although it's a shame ISO 200 is the base level sensitivity for this camera. There is a low "L" setting on the ISO dial, but you won't get the same dynamic range from such shots, which could be a problem when shooting raw and hoping to make adjustments. Crank the ISO sensitivity up and you'll see some luminance noise - but it presents as a kind of grain-like texture throughout, which has a filmic quality to it. Only when zooming in to inspect detail closer will you spot any degradation in quality, but it's only really by the four-figure ISO sensitivities that you'll start to see mottled textures or processing artefacts. As we said of the X-T2: there is some dependency on lens choice. The XF lenses in the Fujifilm stable are, by and large, aimed at the higher-end market, and we got to use a variety in this test: the 16-55mm f/2.8, the 80mm f/2.8 macro, the 56mm f/1.2 prime, and the 10-24mm f/4 ultra-wide zoom. The 80mm is slow for portraits, but sharp when it's on point. Even the "kit" lens 16-55mm has been fantastic throughout. Combine the sharpness of top optics with great image stabilisation and we've been getting some great shots. Experimenting with the Film Simulation modes has been fun too: from the B&W shots of dancers, to the Eterna shots of a flash-lit model, to the vividness of Velvia when shooting a bride-to-be model in a chapel (at just 1/8th second, impressive, isn't it?). All that said, the X-H1 isn't immediately accessible when it comes to getting the right pictures. This will depend on your way of working, of course, but its auto white balance (AWB) has often been well off the mark, while auto exposure (AE) has frequently felt too wide of where it should be, too. In other words: you'll need to setup a distinct way of working or be prepared to put more work in with this camera than some. The Panasonic G9, by comparison, seems better equipped to handle whatevers thrown its way without thought. The X-H1 is also the first Fujifilm X-series camera to really give video capture some serious thought. With 4K capture up to 30fps (or 25/24p), it's got the goods to deliver decent quality, with up to 200Mbps output quality. However, as the X-H1 is built around the sensor and processor of the X-T2 it doesn't have dual processing power, so can't push itself to greater levels. There's no 4K60p, as per the Panasonic G9, to be found in Fuji's stable - which again feels like a bit of a missed trick. That said, the use of image stabilisation, presence of F-Log for proper workflow capture, flicker reduction, ability to use Film Simulation modes live, and a true 4K Cinema resolution are all bonuses. And if 1080p is more your thing then 120fps slow-mo capture is also possible. There is an oddity when it comes to ports, though: the X-H1 features a 3.5mm microphone jack (and high-res recording to 24-bit/48kHz) but there's no 3.5mm headphones jack unless you buy and attach the optional grip. We're sure there's room on the main body for that second 3.5mm, because not everyone will want to use the beast that is the additional grip. In the X-H1, Fujifilm has created a worthy top-tier entry to its mirrorless X-series line-up. It's got the build quality, the style, the stabilisation and the speed to outshine many of its rivals. Finally 4K video gets an overhaul, too, to lure in a whole other audience. That said, the X-H1's main rival, the Panasonic Lumix G9, sets out a strong stall, advancing its Fuji competitor in terms of burst speed and video ability, thanks to a more advanced processor operating as its backbone. The G9 is also less hard work when it comes to auto exposure and white balance, plus it's a smaller scale camera that's just easier to handle. Plus the X-H1 has some issues with autofocus when using the smallest point available. Where the X-H1 will appeal, of course, is with its larger sensor size, higher resolution and tri-adjustable LCD screen. Add the optional battery grip and it's transformed into even more of a beast, elevating it to often lofty heights that will lure in enthusiasts and pros alike. Whether the additional size and weight in this chunkier format will make sense over the X-T2, however, is a question that many will have on their lips... because it's smaller brother is the less niche and often more attractive prospect. Panasonic's top-end stills camera is a smaller beast than the Fujifilm, delivers more consistent images straight out of the camera and has some more video smarts, too. If you've got the time to put in with the Fuji then it's a solid option, but the G9 feels more versatile and accessible. The supposed step-down camera in the X-series range, the T2 will deliver image quality just as good as the H1, without the bulk or overall cost. For many this will make it the more appealing option, unless you're in a more pro-level niche.